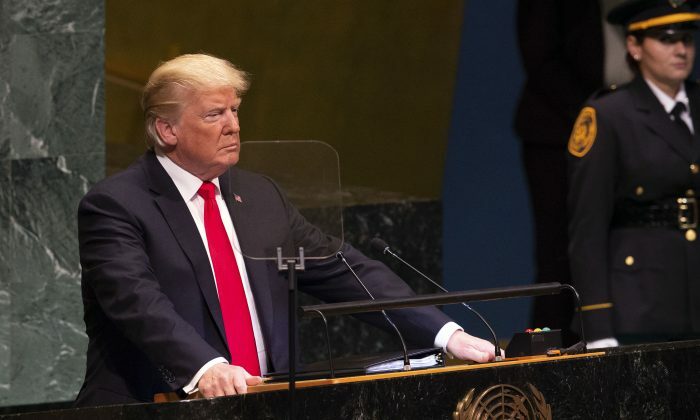 NEW YORK—Building on his inaugural United Nations speech last year, President Donald Trump expressed his desire for a world where nations protect their sovereignty, but show tolerance toward other countries. Trump’s address to the General Assembly session on Sept. 25 lasted about 30 minutes and touched on his domestic successes with the economy and jobs, before moving onto foreign affairs. Trump took a strong stance against globalism, while denouncing socialism and communism. 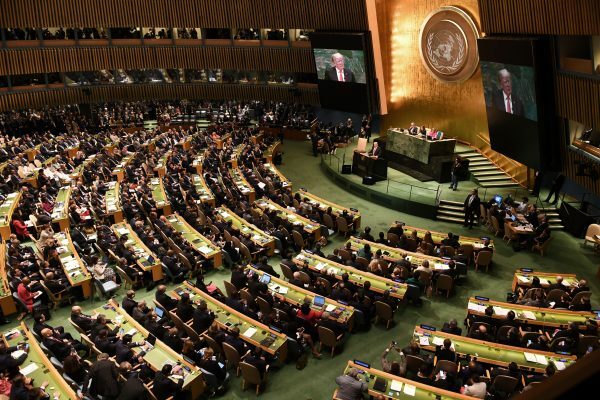 Over the past year, the United States has pulled out of the Paris climate accord, the U.N. Human Rights Council, and the Iran nuclear deal; has denounced the International Criminal Court; and has refused to participate in the new Global Compact on migration. “We will never surrender America’s sovereignty to an unelected, unaccountable, global bureaucracy,” Trump said. About the Global Compact on migration, he said, “Ultimately, the only long-term solution to the migration crisis is to help people build more hopeful futures in their home countries. Make their countries great again. Trump said he is working with Latin American countries to confront threats to national sovereignty from uncontrolled migration. Trump blamed socialism for the chaos in Venezuela, where more than 2 million people have fled the Maduro regime. The president announced a new raft of sanctions to go into effect immediately against Maduro’s inner circle and close advisers. He has also directed Secretary of State Mike Pompeo to look at the foreign-aid packages the United States distributes. The president mentioned progress with North Korea, the ISIS terrorist group, and the Middle East. He said the United States will respond if the Assad regime deploys chemical weapons, and slammed Iran for its backing of terrorism. Additional sanctions against the Iranian regime will go into effect on Nov. 5. “We cannot allow the world’s leading sponsor of terrorism to possess the planet’s most dangerous weapons. We cannot allow a regime that chants ‘Death to America,’ and that threatens Israel with annihilation, to possess the means to deliver a nuclear warhead to any city on Earth,” he said. Trump said it is ultimately up to the nations in the region to decide what kind of future they want. Trump heralded the importance of being energy independent, while admonishing Germany for its plan to become dependent on Russia for the bulk of its energy via a new pipeline. He also called for OPEC to lower oil prices and contribute to military protection. The president criticized unfair trade practices, saying the United States has been taken advantage of for decades and that he is currently reworking trade deals—starting with Mexico and South Korea. “Many nations in this hall will agree that the world trading system is in dire need of change,” he said. Trump singled out China as a trade-abuser, saying that the United States lost 3 million factory jobs and 60,000 manufacturing jobs to China after the latter joined the WTO in 2001. “Those days are over. We will no longer tolerate so much abuse,” Trump said. The United States has set tariffs on $250 billion in Chinese-made goods so far. He wrapped up his speech by talking about sovereignty and independence.